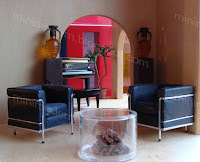 This post is for a friend who wants to purchase the Play-All-Around dollhouse but is unconvinced that they can use realistic modern furniture with it. I did this quick before and after for their benefit. 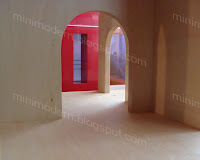 The structure is so minimal that it lends itself to being decorated in children's chunky pieces or realistic designs. To my friend: I'm no expert but I really really think it works okay. It is soooooooooooooooo refreshing to see minitures that reflect design. (tired of twee) Love your sense of humor too. The house really transforms when decorated and photographed. It seems like a good pick for your friend.